There are three main types of child restraint systems: infant seats, convertible seats, and booster cushions. They are classified according to the child's age and size. The following section provides general information on securing a child restraint using a three-point seat belt. Refer to page 48 and page 50 for information on securing a child restraint using ISOFIX/LATCH lower anchors and/or top tether anchorages. A child seat should never be used in the front passenger seat of any vehicle with a front passenger airbag – not even if the PASSENGER AIRBAG OFF symbol near the rear-view mirror is illuminated (on vehicles equipped with Occupant Weight Sensor). If the severity of an accident were to cause the airbag to inflate, this could lead to serious injury or death to a child seated in this position. Always refer to the child restraint manufacturer's instructions for detailed information on securing the restraint. • When not in use, keep the child restraint system secured or remove it from the passenger compartment to help prevent it from injuring passengers in the event of a sudden stop or collision. • A small child's head represents a considerable part of its total weight and its neck is still very weak. Volvo recommends that children up to age 4 travel, properly restrained, facing rearward. 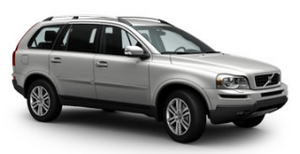 In addition, Volvo recommends that children should ride rearward facing, properly restrained, as long as possible.